Hello everyone. 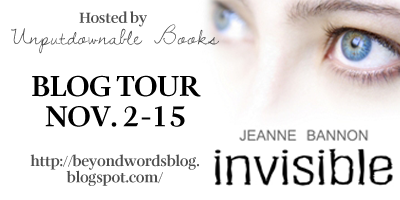 Today is my stop on the Blog Tour for the book, Invisible by Jeanne Bannon (it was released on September 30th 2011 by Solstice Publishing). The author will be sharing with my readers today a wonderful Excerpt from her book. She has also offered my readers a free e-book as a giveaway. Very cool! Invisible looks like an amazing read. 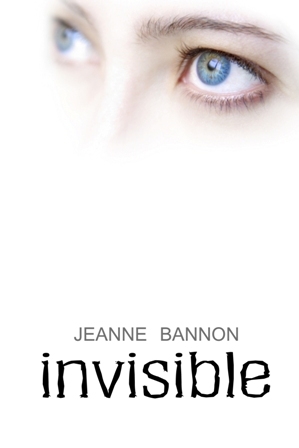 I hope everyone will enjoy this post and learning more about the new young adult author, Jeanne Bannon and her new book. There are three boys and a girl - Nino Campese, Tyler Campbell, his girlfriend Julia and Jon Kingsbury. They’re seniors like me and even though we’ve known each other since kindergarten, once adolescence hit and separated the weak from the strong, the cool from the nerd, I became prey. I was hunted by those better looking, and with more attitude, simply for their entertainment. I hope everyone enjoyed the Excerpt from the book Invisible and loved to learn more about the book. So Here is the fun part - The Giveaway! =D The Author Jeanne Bannon has agreed to giveaway a copy of her new book to one LUCKY reader on my blog. So please enter and have fun! Thank you Beckie for being part of the tour! Wonderful post and comments. ! Hi Jeanne! Your book looks terrific, and after reading the excerpt provided, I KNOW I'm going to enjoy reading it!! Thanks so much, Julie :) You've made my day! Loved reading the excerpt...now I need to read the book! !